The Miracles of the Church website is devoted to the extraordinary miracles that have occurred in the Catholic Church throughout the centuries including miracles of the Eucharist, miracles through the intercession of the Saints, blood miracles, incorruptable bodies of the Saints, the crucifix of Limpias-Jesus comes alive, miracles during the appearances of the Blessed Virgin Mary and many others. The author endeavors to be always faithful to the Catholic Church and its teachings. The Miraculous Crucifix of Limpias is located in the 16th century Church of St. Peter in Santander, Spain, not far from the popular alleged apparitions of the Blessed Mother in Garabandal, Spain. 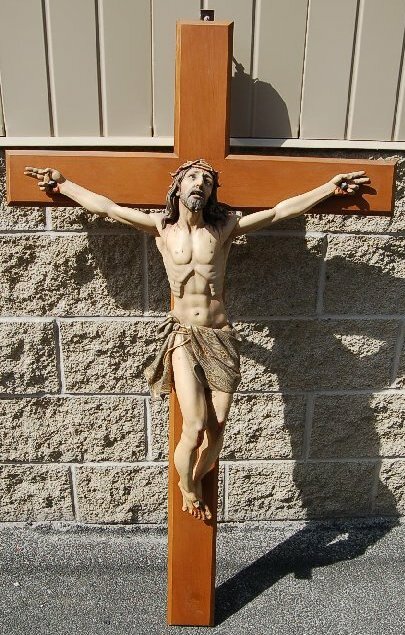 The Crucifix is a beautiful 6 foot life-size figure of the crucified Jesus, and is located directly above the main altar. Arranged on either side of the crucifix, and somewhat below it, are life-size figures of the Sorrowful Virgin Mary and the Apostle John. 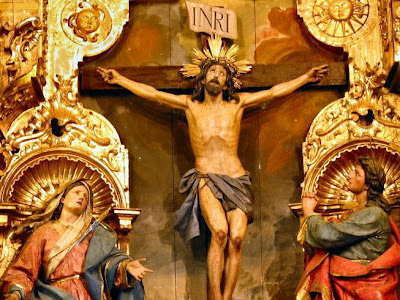 The miraculous crucifix is believed to have been the work of Pedro de Mena, who died in 1693, and the crucifix was given to the church by Father Diego de la Piedra Secadura, who had been born at Limpias in 1716. The crucifix is a meditation on the sufferings of Our Lord portraying Him in the final moments of His agony. Measuring six feet tall, the corpus is clothed with a loin cloth that is held in place with a rope. The feet are one atop the other and are pierced with a single nail. The index and middle fingers of both pierced hands are extended as though giving a final blessing. The face of Our Lord is of particular beauty, with its glass eyes looking toward Heaven so that, for the most part, only the whites of the eyes are visible. “One day in the month of August, 1914, I went into the parish church of Limpias, by order of my friend D. Gregorio Bringas, to fix the electric light over the high altar. In order to be able to work more comfortably I put two large cases on the altar, and on them a ladder, the ends of which I leaned against the wall that serves as a background to the figure of the Crucified One. "After I had worked for two hours, in order to rest myself a little I began to clean the figure so that it could be seen more clearly. My head was on a level with the Head of the Christ, and at a distance of only a couple of feet from it. It was a lovely day and through the window in the sanctuary a flood of light streamed into the church and lit up the whole altar. 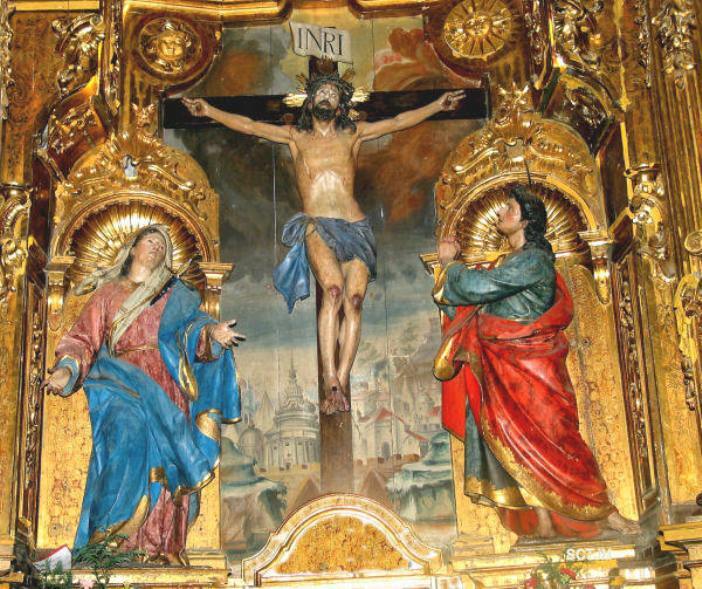 As I was gazing at the crucifix with the closest attention, I noticed with astonishment that Our Lord's eyes were gradually closing, and for five minutes I saw them quite closed. "Overwhelmed with fright at such an unexpected spectacle, I could still hardly quite believe what I saw, and was about to come down from the ladder. Notwithstand¬ing, my bewilderment was so great that my strength suddenly failed me; I lost my balance, fainted, and fell from the ladder onto the edge of the altar itself and down the steps into the sanctuary. "After I had somewhat recovered, I was convinced from where I lay that the eyes of the figure on the crucifix were still closed. I pulled myself together hastily and went out in order to relate what had happened, and also to be medically examined, for my whole body was in great pain from the fall. "A few minutes after I had left the church I met the sacristan, who was just going to ring the Angelus, as it was twelve o'clock noon. When he saw me so agitated and covered with dust he asked if anything had happened to me. I told him what had occurred, whereupon he said he was not surprised as he had already heard that the Santo Cristo had closed His eyes on one other occasion, and that it was probably brought about by the working of some interior mechanism. "I asked him to collect the tools together and to put away the ladder, and generally to tidy up everything again. Then when I reached the college I told the Fathers the whole of the above incident. I was examined, but no wounds were found on my body and no broken bones, only a few bruises of slight importance. "Thinking that the movement I had observed in the eyes of the figure was to be attributed in any case to a mechanism, I attached no further importance to the vision, but tried, however, to find out on what occasion this fact had already been observed, but without success, as no one could give me any information whatsoever about the matter. Father Antonio Lopez wrote the above account of his experience at the request of his superiors, and then kept the matter to himself. It was only on March 16, 1920, a year after the many miracles of 1919, that the above declaration was made public. During the time of the numerous miracles of the crucifix of Christ in Limpias the practice of the Catholic faith in the village of Limpias and the surrounding area was waning. The little town that is favored with the possession of the miraculous crucifix is located on the River Ason in the northernmost part of central Spain, near the Bay of Biscay. Because of this fact it is written that the venerable old Church of St. Peter that houses the Limpias crucifix was practically deserted at the time of the first miracle in 1914, and later those that took place in 1919. In light of this, in an effort to re-ignite devotion to the beautiful crucifix and to encourage attendance at the venerable old church, the pastor, Rev. Thomas Echevarria, decided to accomplish this by means of a mission. After applying to the Capuchin monastery at Montehano, near Santander, two priests were placed at his disposal: Friar Anselmo de Jalon and Friar Agatangelo de San Miguel, both of whom were known for their apostolic zeal and success as missionaries. On the last day of the mission, Sunday, March 30, while the Archpriest D. Eduardo Miqueli was celebrating Holy Mass, both missionaries were occupied in the confessional. Fr. Agatangelo, however, delivered the day's sermon based on the words, "My son, give me thy heart." (Prov. 23:26). While he was speaking, a girl of about 12 entered the confessional of Fr. Jalon and told him that the eyes of Christ on the cross were closed. Thinking that this was the product of the child's imagination, the priest ignored her claim until other children also came to him with the same message. After Fr. Agatangelo finished the address and was about to return to his confessional, Fr. Jalon approached him and told him of the children's claim. Both priests then looked at the crucifix but saw nothing unusual. Presently a man in the congregation shouted for everyone to look upon the crucifix. In a few moments the people confirmed with great excitement what the children had seen. Some of the people began crying, others shouted that they had seen a miracle, others fell to their knees in prayer while others called out to God for mercy. After the parish priest was called from the sacristy and was told that the eyes of the Crucified were opening and closing and that the figure was turning His gaze from side to side, he, too, fell on his knees to pray. But his prayer was soon interrupted by many of the people who declared that the figure was perspiring and that Fr. Jalon should climb up to the crucifix to verify it. When a ladder was produced, Fr. Jalon climbed up and saw that the perspiration covered the figure's neck and chest. After touching the neck, he looked upon his fingers that were wet with the fluid. As verification of what had taken place, he showed his moistened fingers to the congregation. Once again agitation and excitement gripped the people so that it was a long time before they were calmed. None of the priests saw the movements of the eyes, but Fr. Agatangelo later saw the miracle several times when he prayed alone in the church at night. A report of all that had taken place was given by the Archpriest D. Eduardo to the bishop of Santander on April 2, 1919. This report was later published in the Boletin Eclesiastico of the diocese of Santander. The second set of public apparitions first took place on Palm Sunday, April 13, 1919, when two prominent men of Limpias approached the altar. Speaking of hallucination and mass hysteria as they looked upon the crucifix, one of them suddenly pointed upward and fell to his knees. At once the other man also fell to his knees, crying for mercy and proclaiming his belief in the miracle. The third apparitions took place on Easter Sunday, April 20, in the presence of a group of nuns known as the Daughters of the Cross who conducted a girls' school in Limpias. They saw both the eyes and lips of the Santo Cristo move. At this time some of their students also saw the miracle, as did a group of people who were reciting the Holy Rosary. Their experience was quickly reported to the parish priest. The manifestations were repeated almost daily from April 24. One of the first to declare his experience to the secular press was the well-known and highly respected D. Adolfo Arenaza. His testimony was published May 5, 1919 in the newspaper La Gazeta del Norte, which was published in Bilbao. He reported that he joined a procession going to Limpias in order to visit the crucifix. While looking through his field-glasses he saw the movement of the eyes four times. He further stated that it could not have been an effect of the light nor an hallucination, since people saw the miracle from all parts of the church. He then asked, "Does Our Lord really move His eyes ... I am rather of the opinion that He really does move them, for I have seen it myself." “I could perceive two movements of the jawbone, as if He were saying two syllables with His lips. I shut my eyes quite tight and asked myself: "What will He have said?" The answer was not long in coming, for in my innermost self I clearly heard the significant and blessed words, "Love Me!" One early group of pilgrims under the leadership of the Bishop of Toledo, Joseph Schrembs, arrived in Limpias from America. By the middle of November, 1919, 66 pilgrim trains had arrived at Limpias. Finally, by the year 1921, the number of pilgrims had increased to such an extent that foreign traffic in Limpias was determined to be greater than the visitors to Lourdes. Additionally, numerous Princes, Barons, politicians and other notables also visited Limpias, as did dignitaries of the Church in Spain including bishops and cardinals. Archbishops also arrived from Mexico, Peru, Manila, Cuba, and other foreign nations. The multiple albums that are found in the sacristy of the church of Limpias contain well over 8,000 testimonies of people who had seen the wonderful apparitions. Of these, 2,500 were sworn on oath. Among these witnesses were members of religious orders, priests, doctors, lawyers, professors, and governors of universities, officers, merchants, workmen, countryfolk, unbelievers and even atheists. The are several hundred testimonies from religious worldwide who witnessed the miracles. For example Father Celestino Maria de Pozuelo, a Capuchin monk, who visited Limpias on July 29, 1919 and wrote a detailed report that included this statement: " ... The face presented a vivid expression of pain: the body was a bluish colour, as if it had received cruel blows, and was bathed in perspiration. . ."
Signing their names to this statement were the three priests, nine of the sailors and the lady. "... We all saw the face of the Santo Cristo become sadder, paler, and more bluish-looking. The mouth also was wider open than usual. The eyes gave a gentle glance now at the bishops and then in the direction of the sacristy. The features at the same time took on the expression of a man who is in his death-struggle. That lasted a long time. I could not restrain my tears and began to weep; the others were similarly affected..."
Father Manuel Cubi, an author, lecturer and confessor of the Church del Pilar in Saragossa, Spain gave his statement on December 24, 1919. 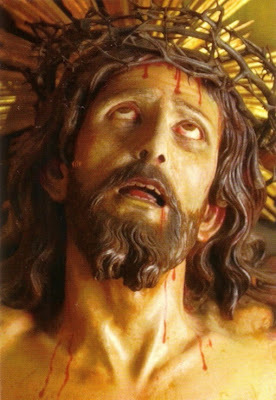 In the company of a group of people, he saw the Santo Cristo in a death agony. There are also many statements from physicians who were at first very skeptical and sought a scientific reason to disprove the “hysteria”. An extraordinary revelation was observed by Dr. D. Pedro Cuesta in August, 1920. The doctor first tells that he was in the company of a priest, a doctor and a married couple. 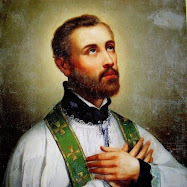 In the morning, during Holy Mass, his companions saw the miraculous movements but he did not, even though he moved from one position in the church to another. That afternoon he was persuaded to return to the church and saw this astounding revelation. "When I fixed my gaze for the third or fourth time on the figure I noticed that the fleshy parts entirely disappeared, so that only the skin still remained, a skeleton on which I could have made anatomical studies. The head was completely dried up, until it, like the skin that I had seen, totally vanished. After I had not seen the figure at all for some time it reappeared, but as if mummified, until later on it was also restored by degrees in its fleshy parts. Yes, I observed clearly the formation of a hypertrophy (enlargement) of the head, which then also extended to the remaining parts of the body. Each of these apparitions was repeated twice. "At the last stage of the second development I could no longer control myself, but cried out in terror and fled out of the church. A cowardly fear had taken possession of me, whereas I had never before known fear-let my description not be set down to exaggeration ... I, who was never ill, thought I should die on the spot. The instinct of self-preservation drove me out of the church or I should have had to be carried out as a corpse. So I stumbled out of the church and confessed with my whole heart to the people standing outside: By my reputation as a physician and on my word of honour, I take my oath to what I state herewith, and which I will also certify and ratify with my blood." "I felt the necessity of taking some restorative [a tranquilizer]," which he did. There is also a report of a non-believer who was a medical student named D. Heriberto de la Villa. His testimony was published in the paper “Del Pueblo Astur” on July 8, 1919. He first strongly declares that: " ... auto-suggestion is quite out of the question, for I did not believe in the miracle when I went." “. . . gaze upon me with a terrible look full of anger, which makes me shudder, and I cannot help but bow my head ... 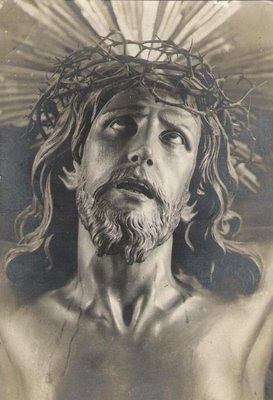 I look up again and see how He is looking to the right, bowing His head, and turns it to the right, so that I can see the crown of thorns from behind ... Once again he turns on me the same angry look which makes such a deep impression upon me that I see myself obliged to leave the church." “... little by little the breast and face became dark blue, the eyes move to the right and left, upwards and down, the mouth opens somewhat, as if He were breathing with difficulty. This I saw for fifteen to twenty minutes ... I also noticed that above the left eyebrow a wound formed, out of which a drop of blood flowed over the eyebrows, and remained stationary by the eyelids. After that I saw another drop of blood fall from the crown of thorns and flow over the face. I could distinctly discern it, for it was very red and contrasted with the dark blue colour of the face. 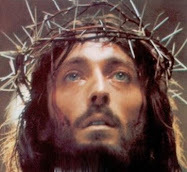 Then I saw a quantity of blood drip from the crown of thorns onto the shoulder, but without touching the face. He opened His mouth wide, out of which a white matter like froth welled. At this moment a Dominican priest mounted the pulpit, whereupon Christ gazed steadily at him for five or six minutes ..."
As noted above, most of those who saw the miracle instinctively felt the need to change locations within the church in order to verify what they had witnessed. For some, the miracle took place the first time they entered the church, but might not have taken place sometime later. For others, the miracle did not take place the first time, but occurred later in the day. Some did not see the miracle at all. As one witness testified: "The fact that these manifestations are seen by some, by others not, cannot be explained by the laws that are prescribed for nature." Bishop Sanchez de Castro, the Bishop of Santander, in whose diocese Limpias belongs, introduced a canonical process on July 18, 1920 in which Rome was notified of the miraculous cures and manifestations. One year and one day later, a plenary indulgence was granted for a period of seven years to all the faithful who visit the holy crucifix. -Lord Jesus Crucified, have mercy on us! "The Wonderful Crucifix of Limpias: Remarkable Manifestations" By Baron Ewald von Kleist, Benzinger Brothers, 1922. Availible in its entirity for free online here . 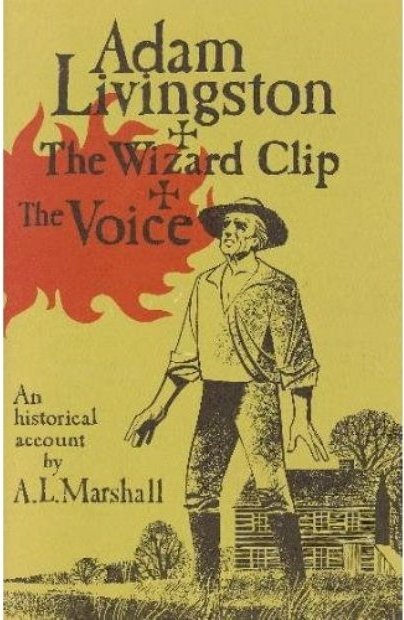 Note that this book was written only 3 years after the events, so the details provided are of very recent memory. Fratello mio, in questo ritratto della morte vedi te stesso, e quello che hai da diventare. "Memento, quia pulvis es, et in pulverem reverteris". Pensa che tra pochi anni, e forse tra mesi o giorni diventerai putredine e vermi. 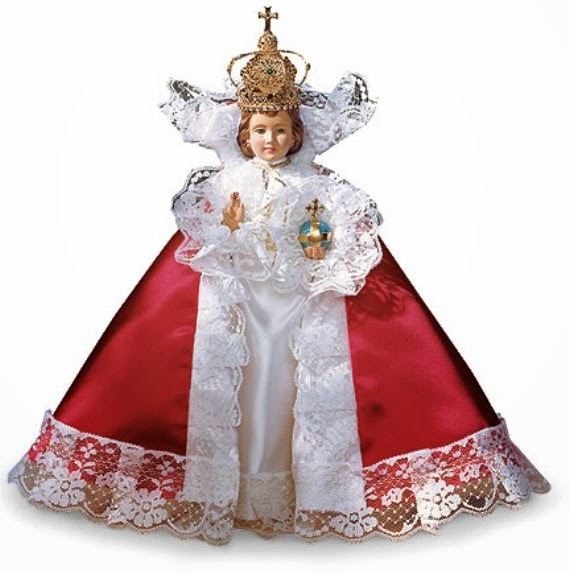 Giobbe con questo pensiero si fece santo: "Putredini dixi, pater meus es tu, mater mea et soror mea vermibus" (Iob 17,14). Tutto ha da finire; e se l'anima tua in morte si perderà, tutto sarà perduto per te. "Considera te iam mortuum", dice S. Lorenzo Giustiniani, "quem scis de necessitate moriturum". Se tu fossi già morto, che non desidereresti di aver fatto per Dio? Ora che sei vivo, pensa che un giorno hai da trovarti morto. Dice S. Bonaventura che il nocchiero per ben governar la nave, si mette alla coda di quella; così l'uomo per menar buona vita, dee immaginarsi sempre come stesse in morte. Di là, dice S. Bernardo: "Vide prima et erubesce", guarda i peccati della gioventù, ed abbine rossore: "Vide media, et ingemisce", guarda i peccati della virilità, e piangi: "Vide novissima, et contremisce", guarda gli ultimi presenti sconcerti della tua vita, e trema, e presto rimedia. NO NECESITO VER ESTOS MILAGROS PARA CREER EN DIOS, PERO EL SIMPLE ECHO DE SABER MEDIANTE LA LECTURA DE QUE HAY MUCHOS MILAGROS INEXPLICABLES Y QUE DE VERDAD LE TOCAN A UNO EL CORAZON...ESTE ES UNO DE ELLOS. 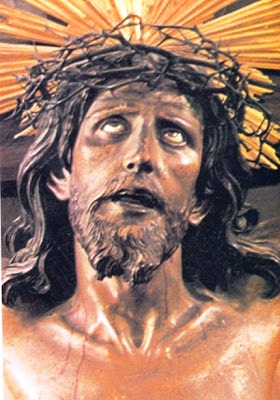 I felt such an emotion in my heart when I saw the face of Jesus on the crucifix that I was in awe. GOD may choose anyone, or even me to witness his works. All I can say is that I felt the connection with Jesus. I am really glad to hear that you were blessed by this article. May Jesus continue to draw you ever closer to Himself. It is absolutely amazing to read how many people saw this miracle on an ongoing basis, and how each were given different views or visions of Jesus. Truly facinating! Read the article? Now see the video! I have had a picture of The Limpias Crucifix for many years with a prayer on the reverse side and explanation of Jesus' eyes opening and closing. The card is from The Companions of Jesus and Mary (Montreal, Canada & Opelousas, LA). It is worn out and I would like a new one; however, both addresses are not available. I would appreciate it very much if you would be able to tell me how to get a new one from them. It bothers me that there are no pictures ( still or motion) of the miracles even though the technology was around to photo document this phenomenon. Why not? So many people visiting but no visual documentation? It was an ongoing event for years but no newspapers covered it? That makes me wonder. Many phenomena don't easily lend themselves to photography, apart from Garabandal where many of the phenomena were caught on early film cameras. But there is very little footage of Padre Pio even though he bore the stigmata for 50 years. Very little too of Fatima even though 100,000 people were on site with many journalists even from Communist newspapers and the sundance was seen up to 25 miles away from Fatima. Thanks for your comments and thanks especially for sharing the video on YouTube of your recent visit to the Crucifix of Limpias in the Church of St Peter in Santander. Those interested can view the video here. Thanks again Shane Paul and may God bless you and your loved ones. 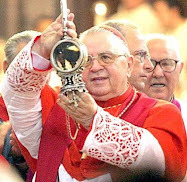 Actually the miraculous phenomenon surrounding the Limpias crucifix was realted in many Spanish newspapers and peridicals, and was often highlighted elsewhere in newspapers worldwide. In fact there was so much interest that the first book detailing much of the phenonmena came out immediately the following year after the events--that is in 1920. This first book was written in Spanish by Andres de Palazeulo entitled "El Santo Crista de la Agonia Limpias". A year later (only 2 years after the events) came the english book "The Wonderful Crucifix of Limpias" which I cited in my article above (I also am posting the link below for those interested). And a year after that (1922) there came a extensive article in English, this time by Hebert Thurston entitled "The Crucifix of Limpias". In it he writes about the "....endless discussions in the local newspapers attracted universal attention to the subject. During the summer and autumn of 1919, the concourse of people to Limpias, some coming privately in motor cars, others by train in organised pilgrimages, was immense, and the vogue still continues down to the present time. Father Kleist, the parish priest estimates the number of visitors at 3,000 or 4,000 a day, and from the beginning of the manifestations down to July, 1921, 26,000 Masses were said in the little town. And later in his article he writes "..Not unnaturally these occurrences at Limpias have given rise to an immense amount of discussion in the leading journals of the Spanish peninsula." Again, this was written three years after the events of 1919, so we see in fact that there was a great deal of newpaper and journal entries about the supernatural events concerning the Limpias crucifix. 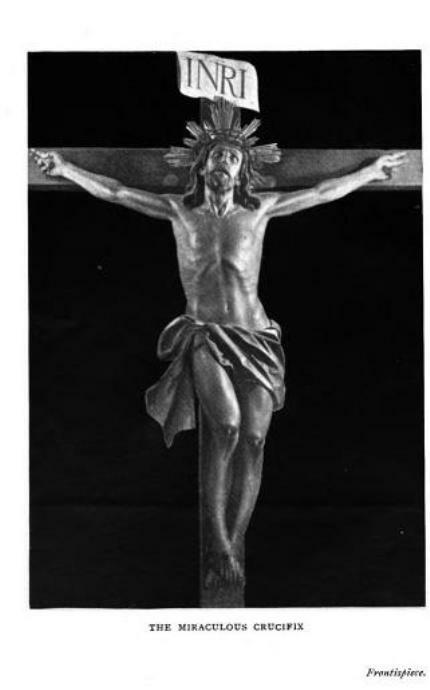 As far as photographs, this is dicussed on page 164 of the book "The Wonderful Crucifix of Limpias" by E. von Kleist. Best wishes and may God bless you and your loved ones. What a wonderful Grace from God to look upon the face of this crucifix. 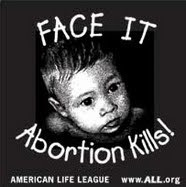 I truly am moved to greater love for Our Lord when I see the agonizing look on His precious face. How Blessed we are to have a Creator who loves us so much that He would take our sins upon Himself and suffer as He did for all humanity and then allow us to receive Him in the Most Blessed Sacrament! Where is St. Peters Church located? I cannot find it on Google map. We are going on a cruise next year, stopping in Bilbao, and I think it might be within driving distance. hfyutilBlessed are those who by the miracle of God's love in their hearts, have faith in God and love for Christ, such that their lives become an occasion of mercy and blessing to all, merely for that love. Keep your heart and your eyes open to the miracles of His love in the world so that it might be spread over the whole earth. One of the problems that Protestants and other Christians have with such manifestations is that there is no way to "try the spirits" that are causing this. Certainly even Catholics would admit that this 6-foot piece of wood, glass and paint is NOT "our Lord." It is simply a representation of Him. And whatever spirit is controlling it does so through the manipulation of matter. Remember the words of Jesus: "If any man shall say unto you, Lo, here is Christ, or there; believe it not. For there shall arise false Christs, and false prophets, and shall shew great signs and wonders; insomuch that, if it were possible, they shall deceive the very elect." It's important for people to realize that this statue is NOT Christ, nor is Christ still suffering. He is in Heaven, sitting on the right-hand of the Father. If you were contacted by someone on the Internet who you didn't know and had never met, and that person offered you a fantastic deal; all you had to do is give him your credit card information or bank account information. Would you do it? Then why believe a spirit that might be lying? Yet what do we get from such miracles? What knowledge is conveyed? Didn't Yahweh specifically condemn the veneration of graven images? How many times do these brethren refer to this statue as "our Lord"? If the image moves as if pain or as if trying to get off the cross, shouldn't someone help him? Would not that remove its pain? The statue is a statue, and it is not Jesus. Remember that the beast is supposed to set up an image in the Jewish holy of holies, and that it would speak? Search the scriptures. Where was there ever a time or place where God created a manifestation in which knowledge or intelligence was not conveyed? Things like this make me suspicious, and I have strong doubts that it's of God. Things like this sound very "Roman" and "Catholic," but not at all like first century Christianity. NUMBERS 21:8"...And the Lord said unto Moses, make thee a fiery serpent, set it upon a pole; and it shall come to pass, that every one that is bitten, when he looks upon it shall live." Moses did exactly as the Lord God had commanded and the Israelites got their healing and miracles! Will you call this some sort of madness? Can God not still manifest Himself today like He did with the early Christians? Darkness cannot drive out darkness...only light can! What a refreshing perspective, John Roberts. I agree, it's dangerous to believe these stories without looking at all the facts. God gave us intelligence for a reason. If all He wanted was a herd of sheep, we wouldn't have been made in His image, with a healthy dose of skepticism built in. I love the analogy to the online credit card scams! Trust is a wonderful thing, but you shouldn't give it all away at once. I was raised Roman Catholic, and as much as I believe in, and love God, Jesus and the Holy Spirit, I have never stopped probing and asking questions, exploring other faiths and belief systems, listening to opposing ideas and theories, and ALWAYS applying common sense and restraint to the unexplainable. For example, what is the purpose of a bleeding, blue, struggling statue of Jesus? #1) Does it make me feel more united with the Trinity? No, it actually goes against what I've come to believe which is what John Roberts so eloquently stated - that Jesus was resurrected & now rules at the right hand of the Father. He suffered for us, He took that burden FOR us, so why is this statue trying to get off the cross? It seems contradictory to Jesus' purpose. #2) If a wooden statue can lip sync, moan & sigh, then why can't it explain to its 'worshipers' what it needs? As John stated, God's true interactions with us have always had a purpose. #3) This may be my compassion rising above my skepticism, but I also want to know why NO ONE has tried to rescue that poor, brutalized, struggling figure from off of the cross. I know that I couldn't just sit/stand/kneel my way through Mass while something or someone suffers right in front of me. PS: Glenn, thanks for letting me air my thoughts. I truly enjoy this site and your other related sites. I also admire the way you respond to visitor comments. You reply with warmth and respect - no matter if you agree or disagree with them. It is not wrong for Our Lord who is in Heaven to raise stones to praise the Father i.e. to testify to he power of God, if men fail to. Christ could always choose a symbol within His temple to communicate to those to whom He wishes. In this regards no Catholic will interprete the motion of a crucifix as some meaningless message if it is so determined that the crucifix moved by the working of the supernatural. It suffices to say that the Message you obtain from viewing the "suffering figure or image of the Lord" is not so different from the Message you get from reading the Crucifixion narrative from Scripture. The difference is that one is more vivid to the eye, and are given the grace to judge which one. Now with regards to whether Christ, who has been crucified once and for all eternity, continues to suffer, we could specifically tell from His compassion by which He underwent His passion. Will not our Lord still find among us people who are as "sheep without a shepherd"? ii. God could be reminding us of the pain our sins cause Him. Scripture says we crucify Christ twice when we who are in the Faith depart from the Way of the Faith. iv. If we fail to proclaim His Passion by which He saved us, He can raise images to proclaim. Let us only count on Spiritual people and Church authorities to judge if this was the Lord's doing and is marvelous in our sight. So is this of God? Rather scary! While initially seeing Jesus come alive on the Cross may seem scary, when we read the testimonials of those who received this exceptional grace, we see that they were all deeply moved by the incredibly compassionate and loving countenence of Jesus as He was looking at them. All of the witnesses seem to have come away with a deep sense of the infinite love and mercy of Jesus for all of us. Lord Jesus crucified, have mercy upon us! St. Francis said to his brothers, after they stated their confusion as to why they were not led to say anything during their time to preach, "Preach, using words if necessary". In a non-Catholic context, there was a preacher named Blessitt, who carried a wooden cross around the world. In these times, we just talk too much. We need to be still, sometimes. As for the statue of Christ, well, we know what we've done. Maybe we have had a conscience clean of really bad things, as we know them, but every sin is of an infinite value and hurts Christ. His angry looks were ones of mercy to snap us out of our sinful behaviors before it's too late and our "little" sins lead to ones the Bible says are deadly. In his ministry, he wouldn't have said what we could do that would lead us to the eternal fires right before dying and making the above no longer true. He died to make heaven possible, having died to take away the price of our first parents' sin, which our deadly sins would have damned us for sure after we knew the truth. Besides, we have his basic teachings in Scripture. What more must he have to say. He is free to remind us of what he said and he is not reliving his crucifixion when appearing in agony. 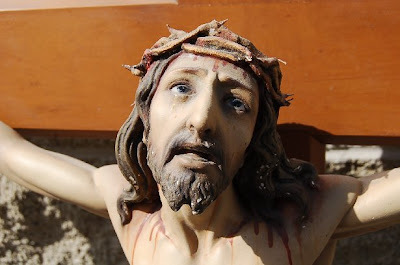 He's reminding us of what our sins did to him during his passion, physically and emotionally, but which still would be hard on him as however that is to his glorified body in Heaven. To the doubters of the apparition of Our Lord: St. Francis also experience the same apparition at San Damiano. The corpus even talked to him and he believed and obeyed what he was told do. St. Francis never asked if the Corpus of the San Damiano crucifix is Christ. He believed and obeyed. I concecrate myself to Mary and Jesus , and place myself under their mantels and protection help and care.Help me to be a true saint of the end times,disciple of Mary ,and warrior of the traditional Roman Catholic Apostolic faith . Help me to be saved to go toheaven not hell nor purgatory , limbo ,also not to enter shamefully into heaven and get and go to the highest glories of heaven.For me to live the faith fully always show yourself with me all of heaven especially Mary that I may come to God. Please go to the website of Mary Kay Baxter who was taken by Jesus to Heaven and Hell between 2 am and 5 am each night for a few months in the 1970 and has travelled world over sharing what she saw of the amazing beauty and life of Heaven and the horrible desolation and torment of Hell. Remember that we choose Hell or Heaven by the way we live here. The Lord revealed that He created Hell for Demons, not for us unless we choose to be guided by Evil. It helped me repent of my serious sins and to keep trying to follow Him. I now have more peace in my life and true joy, but I accept the 'down times' as my cross which is possible to carry with His help and I try to help others. Some refuse His word, so I go on to use my energy for those who are Hungry for Him, especially Prisoners. Jesus suffers with each one of us. The suffering Christ is imprisoned in the hearts of those in Mortal Sin. The Resurrected Christ is dwelling in the hearts of all of us sinners trying to be holy. He is allowing trials and walking us toward increased sanctity when we bear all for Him. He is also 'decorating' our lives with blessings, great peace amidst suffering when we have the attitude of "Jesus, I Trust In You" from the Divine Mercy Apparition. Is He suffering in His Resurrected Body with us when we have physical illnesses, esp Cancer? This I do no know because God's ways are mystical.